I gushed over Hayao Miyazaki’s Tonari no Totoro (My Neighbour Totoro) and Tenkuu no Shiro Rapyuta (Laputa: Castle in the Sky) when I first watched them as an eight year old in Chiba, Japan. It was the era of video tapes and VCR players. After moving to India, with the onslaught of the VCD revolution, we (my parents, brother, and I) watched on helplessly as our beloved recordings deteriorated beyond salvation. That’s where the matter stood until four years ago, when You Tube came to the aid of my never-ending effort to recapture my childhood memories. Copyright issues notwithstanding, some brave soul who believed in spreading the Studio Ghibli magic had uploaded three (the aforementioned two and Kiki’s Delivery Service) of Miyazaki’s movies into You Tube (sadly, these have since been removed from the site). I gushed and raved anew as I rediscovered these enchanting movies from my childhood days and have been raving ever since. As if I’d been given a lucky charm, things started getting better from this point onwards. Our nearly decade long search finally came to an end a year ago, when a friend of my father’s sent us almost the entire collection of Studio Ghibli (the Japanese animation studio founded by Miyazaki, Takahata, and Suzuki) movies on a single DVD! This amazing treasure trove of a DVD is my key to a magical world of inspired storytelling, finely detailed animation, restrained yet nuanced emotions, timeless human values, and unbridled folkloric creativity that infuses everyday existence with a kind of magic realism. As a child I thought of them as movies for children; now I look at them as timeless wonders beyond categorisation. In my mind these are some of the best movies, of any kind, ever made. Even now, 17 years since first contact, Miyazaki and his long-time creative collaborator Isao Takahata never fail to surprise, amaze, and enchant. It’s only been a couple of months since I discovered a gem of a movie — Omohide Poroporo — hiding amongst the other marvels in my DVD. 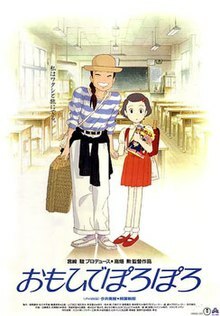 Produced by Miyazaki and written and directed by Takahata, Omohide Poroporo (literally “memories come tumbling down”, but known in english as Only Yesterday) follows Okajima Taeko — the 27 year-old narrator who lives and works in present day (1982) Tokyo — on her ‘safflower-picking’ vacation to the country-side. On the train journey from Tokyo to Yamagata she begins reminiscing about her life as a 10 year-old school-girl in 1966. Her reminiscences continue throughout her vacation, even as she casually fits into the rustic life of the village and gradually falls in love with a young farmer, Toshio. As realistic as the subject matter is, the narrative technique and animation are nothing short of magical. Each frame of Taeko’s memories is beautifully detailed and tinted with picture postcard-like colours. The hazy yet vivid nature of memories is translated into a striking visual detail by a subtle fading at the edges of every frame. The country side is lushly animated and coloured in dark and light hues of green, wooden brown, safflower red, and paper lantern yellow. Words, though, simply cannot do justice to the brilliant evocation of school and family life in the late 1960s and the almost tender delineation of the personalities of Taeko’s parents, particularly her father. I would love to continue writing and raving over this truly wonderful movie, but I think I’ll stop here with just one additional detail: music. Everything from Spanish matador music, Hungarian folk songs, and Brahms’s Hungarian Dance No.5 to music and songs from children’s TV shows from the 60s has been made use of to paint the film in various nostalgic hues. In my opinion, life would be a few shades less luminous if one hasn’t watched, nay, experienced the Studio Ghibli films. They are wonders. They are marvels. They are miracles — miracles that light up my life at the most unexpected moments. This entry was posted in Movies, Notes on Movies, Reminiscences and tagged Brahms, Ghibli, Hayao Miyazaki, Hungarian Dance No.5 in G Minor, Isao Takahata, Japan, Kiki's Delivery Service, Laputa: Castle in the Sky, Miyazaki, My Neighbour Totoro, Omohide Poroporo, Omoide Poro Poro, Only Yesterday, Studio Ghibli, Takahata, Tenkuu no Shiro Rapyuta, Tonari no Totoro. Bookmark the permalink. 2 Responses to Notes on Movies: Omohide Poroporo: When Memories Came Tumbling Down! Hey I want my life to be luminous too !! I want to experience all these miracles and marvels !!! My dvd man ,here I come. Surendran..thanks for this recco..what if my “man” doesn’t have these…where else can i get them? Anu…thanks! Always glad to read an enthusiastic comment.